Yum yum!! 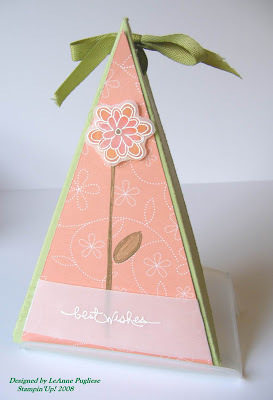 I combined it with today's SCS sketch challenge, and although the card was fun to make, it was hard to photograph!! It really looks better IRL! I hope you can get a good look at it in the closeup view! 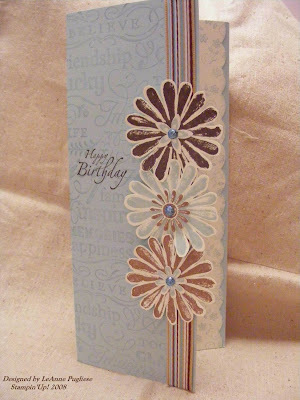 The folded Soft Sky base is 4 x 8 1/2", stamped with Tres Chic also in Soft Sky, with an edge folded back. I covered the front edge with some striped ribbon from Michaels. 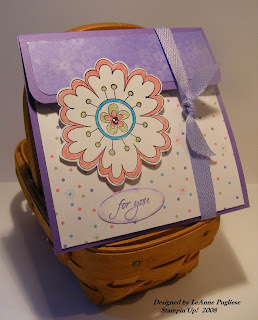 I stamped the large flower from Looks Like Spring in each of the colors, and also stamped the small flower trio as well. I cut & punched them out (why did they retire that punch?) and mounted them on the fold. But before I did that, I added some sparkly brads in the centers of the flowers. They are just regular silver brads on which I stuck a mini glue dot. I then kind of smooshed the glue dot around the head of the brad and dipped it in SU's new colored glitter. Voila! Sparkly brads in about 30 seconds!! 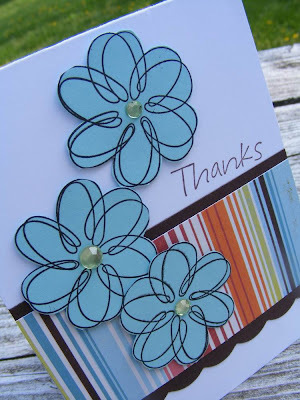 I finished the card by stamping the flowers from Boho Backgrounds in Soft Sky on a piece of Very Vanilla that I had scalloped with my corner rounder and adhered this to the inside back edge of the card. I do need some birthday cards, so I went ahead and stamped a sentiment on the front of the card in Chocolate Chip. My feeling is that the flowers are in too straight of a line, I feel like they need to be more randomly spaced, but it is done now! Thanks for looking! I have made these little boxes several times, but not recently and not since blogging, so I thought I would share it with you. The pattern and directions can be found on Becky Oehler's blog here. This one is a gift for my upcoming club hostess; we will be learning how to heat emboss on vellum, so I made this to go along with the project. I just haven't decided what to put inside yet!!! LOL! 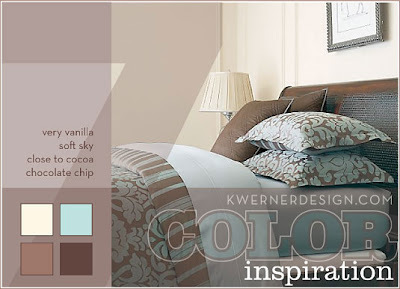 This is a color combination I really like and use it often. I have really enjoyed the view out into my back yard and little flower bed this spring. 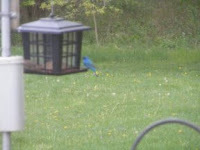 My most exciting moment was seeing this male indigo bunting on my feeder. These birds only stay for a day or so, so to see him actually land and feed was a real treat! This next little fellow has been spotted a few times waddling between my DH's two work sheds....here he is behind our dinghy stored at the edge of our yard. 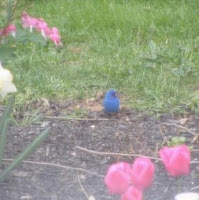 I took both these pictures from inside the house, through a window and a screen, so they are not real clear. Cute, but I don't want him around my house!!! 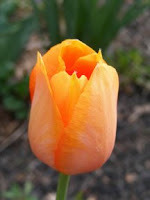 Here is a beautiful tulip, just one of several in an array of pinks and oranges. Mine always seem to bloom late, so I am still enjoying them. Thanks for visiting my Pennsylvania back yard with me! 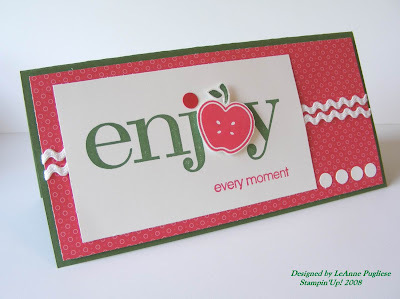 Well, my stampin' creativity seems to have decided to go into hiding....I am really having trouble coming up with new, fresh stuff. 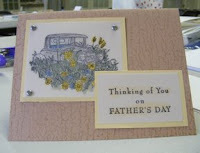 This card today is totally CASE'd from someone.....I wish I could remember on whose blog I saw it!! I will give them credit if I figure it out (I guess I should write these things down when I see them!). Pretty basic & simple, the apple was inked with Real Red and the stem colored with a Garden Green marker, the whole thing cut out & popped up on dimensionals. The "i" is dotted with a punch-out in Real Red, then I added four more punch-outs in Whisper White just to balance it out. Baby rickrack is from my sewing stash a long, long time ago! Well, in an effort to stamp quickly and efficiently, I think I may have made my latest card a little "bare". And I've taken the photo at night, so it is way dark! Anyway, it's done and it will be a good "guy" card, I guess. The Color challenge today was Purely Pomegranate, Soft Sky & Black. 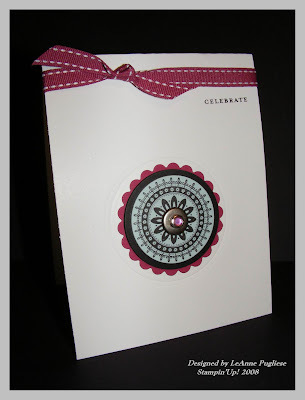 I stamped the medallion from Boho Backgrounds in Basic Black on Soft Sky; used a Nestie to cut it out, added another black cardstock circle behind it, and a scalloped PP circle behind that. I also embossed a circle on the white card. I added a jumbo eyelet with my crop-a-dile, & a rhinestone brad, ala Silke, and added PP stitched ribbon at the top. The only sentiment is a rub-on from Cherished Memories. That's it for tonight! I loved today's challenge at SCS! 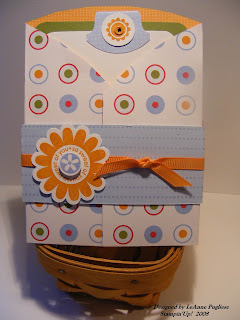 What a fun card to make....so many possibilities on this one, I know I will use it a lot! This card is pretty straightforward, no special techniques other than distressing one side of the diagonal. Since I have a lot of nautical-loving guys in my DH's family, I can see me using this set from Impression Obsession a lot! I used a little clip from my Hodgepodge Hardware to keep the card closed, and added a small piece of twill fastened with a matching brad, just for some interest. I have left the inside blank so I can stamp a sentiment when I need one. I think this is a versatile set that could be used for lots of occasions! Thanks for looking! Kim at It's So Pretty! It's So Cute! Be sure you check out these awesome blogs--and give them a comment of encouragement & appreciation! Thanks again, Silke! Today was Stamp Camp! 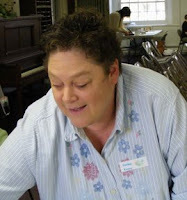 My friend and downline, Lori, and I had a camp where we made cards for men and boys. We had a great time! 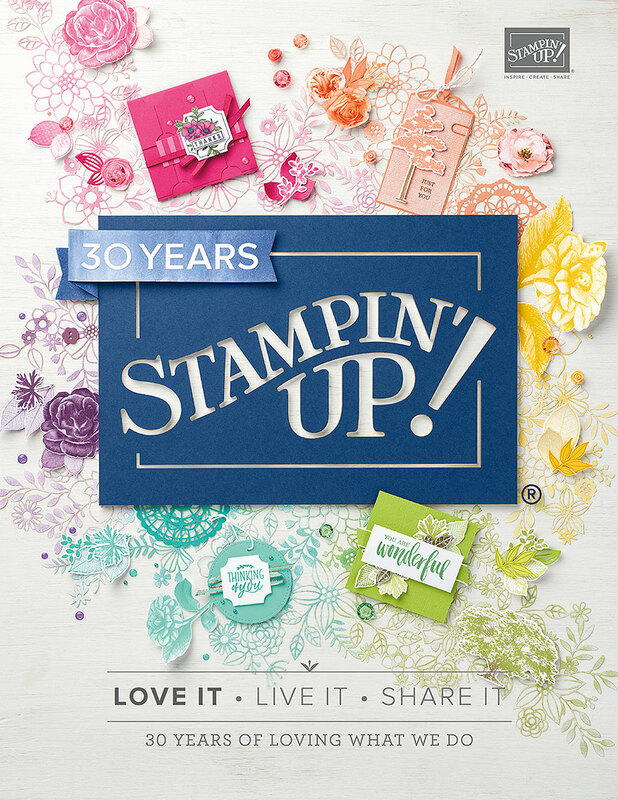 !Here are some of the girls stampin' away (if the pix are bad, it's MY fault, not theirs!!!). And here are the projects we made. 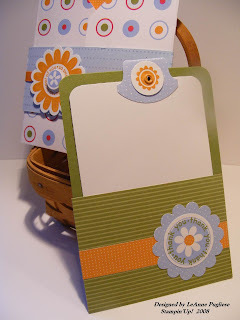 I really enjoy doing Sharon Johnson's challenges--you can always be sure they are creative, but doable! Today's was to think outside the box.....and use a stamped image for something other than it was created! I feel I am rather uncreative when I see what others come up with, but I had a little inkling of an idea, so I pursued it. I have to admit, this card makes me giggle....I love bling as much as any other girl, but it is just not something I use on my cards on a regular basis!!! I was thinking that this heart stamp sort of looked like the top of a strapless dress. I have seen dresses on SCS with ribbons as skirts, so I know this is not an original idea, so to whomever came up with it, you've got the credit!! I would have rather had a more solid heart for the bodice, but it sort of looks lacy, if you have imagination! Anyway, it is stamped in Black Craft ink and embossed with Iridescent Ice EP. The skirt is six pieces of retired black organdy that have been tucked into a slit I made with my SU Craft Knife. I tied some gold cord around the waist to finish it off. The giant bling is from Mike's; sentiment is My Favorite Things' Essential Sentiments. And I can tell you, that's the first time I have ever used that particular sentiment!! The swirls are from Sweet Shapes (been using that a lot lately) stamped in Encore Gold. I also drew some swirls on the skirt with my Jelly Roll pen, but it is hard to see. Anyway, thanks for looking!!! And remember to think outside the box! 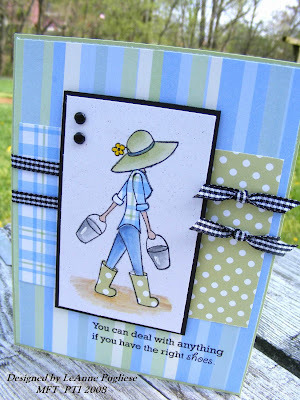 I actually made this card BEFORE today's SCS Challenge to make a card using some scraps from your table!! This glittery chipboard flower had been originally been on THIS card but fell prey to a little liquid mishap during stamp club---oops! I was able to salvage the chipboard and it was sitting there all lonely, so I decided to "recycle" it in honor of Earth Day. 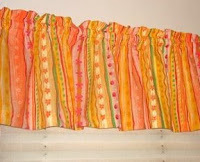 I used a piece of Summer Picnic DP I had tossed to the side along with a piece of wide Real Red grosgrain. 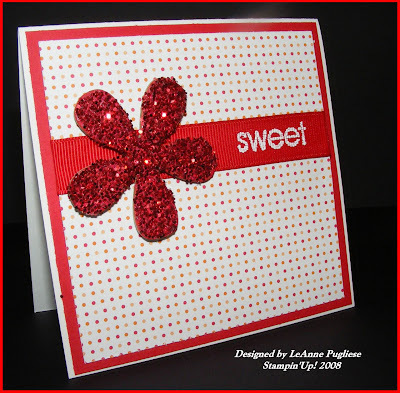 For fun I wanted to see if I could emboss something on the ribbon, so I stamped "sweet" from Sweet Shapes in white EP, and it worked! The image is not perfectly clear because of the ribbed-ness (I know that's not a word!) of the ribbon, but it is still pretty cute. I think I may use this for my niece's college grad card. And I am feeling good because I recycled something, even if it's not "green"! TFL! Just a quick post, gotta run! This is for today's SCS Challenge as well as Kraftin' Kimmie's challenge. The portion I used scissors on was the puppy's head! Click on the photo for a closer look! Thanks for looking! This was a fun challenge but I must say, I cannot get my photo to capture the true colors of this card!!! I tweaked the layout a little because I wanted to get the sentiment on there (plus peanutbee said it was okay), so I hope it still qualifies! The shirt & boots are paper pieced; the rest of the image is colored with an aquapainter filled with alcohol (see tutorial here) and ink from my inkpads. DP is a myriad of Dollar Store & Michael's. Her little buckets are highlighted with a gel pen. Thanks for looking! Look at this pretty card I got in the mail today---the ONLY worthwhile thing in the bundle, I must add! It was from Denise (peanutbee) thanking me for her blog candy! 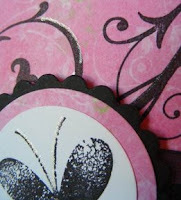 I love the bling centers, the striped DP and the scalloped edges, the clean simplicity of it all!! It's so much fun to get mail! Make sure you check out her blog, too! 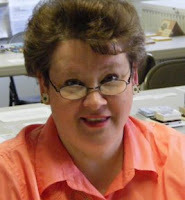 She has some wonderful cards posted there. Especially today's! Delicious colors! 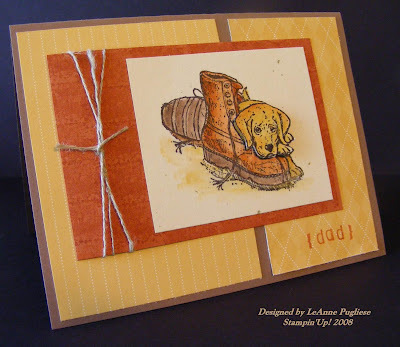 I was not going to post this card, even though I had fun stamping it, it just turned out a little too busy for my tastes. 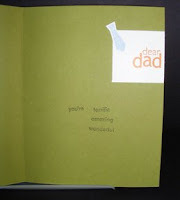 But after reading this post from Jessie (whose blog/designs/cards are incredible!!!) I decided to go ahead and do it!! It was an inspiration challenge from Tammy and I love all the colors that were in the curtain so I thought, "This will be fun!". I decided to go with a polka dot theme, and pulled out as many polka dot things I could find. I even had polka dot ribbon for the stem, but that was just too too much! I even added Crystal Effects on the flower center and the boot, but you can't see it in the photo. Anyway, someone will enjoy it as a get-well card, as it seems that I have needed way too many of them lately! Thanks for looking! The only bad thing about blog surfing is that you find SO MANY sites where there are wonderful sketches...you just can't look at them all, let alone participate in them! But I have been wanting to try Jen's sketches here. And I am just a go-against-the-grain girl.....if everybody is using a particular DP or stamp image that is popular at the time.....that makes me want to NOT use it!! I guess I march to a different drummer, hah! So I pulled out an old retired stamp set that I refused to part with (but haven't used it since!) and decided to use it. It was a hostess set called Provencal and I thought the feeling of the set went well with these two Basic Grey DPs I had. 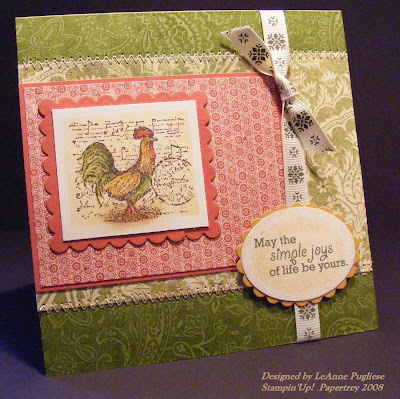 Mr Rooster is colored with inks and a blender pen on Very Vanilla after being stamped in Stazon Brown. I created a "wobbly-line" (not straight cuts) window with some lightweight paper and masked the outer portion of the image and daubered the colored image with More Mustard. I did the same with my sentiment but used a Nestabilities die. I also used a Nestabilities die for the Ruby Red backing for Mr Rooster, but I didn't have quite the right proportion for my size rectangle. So I remembered reading Sharon Johnson's blog about using a longer rectangle, then cutting and adhering it to make the size you need. Worked like a charm!! You probably can see it on the closeup, but from afar, it is not noticeable. 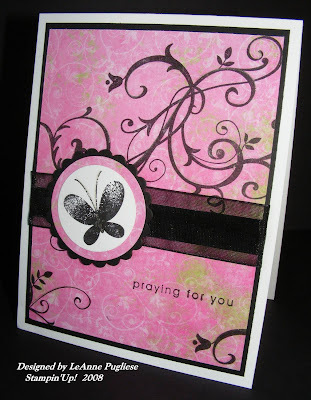 The background is stamped in Paisley with Old Olive ink; ribbon is from Mike's. The sentiment is also lightly stamped with Linen. And I used my sewing machine!!!! I hope you can see the zig-zag stitching at the top and bottom of the DP!! TFL! Have a great day! Wow, yesterday I came across this wonderful blog....Mainly Flowers. 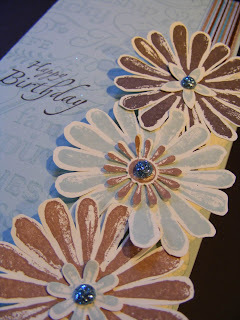 This stamper has some wonderful ideas for creating flowers for cards.....check it out! 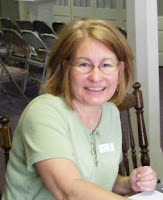 I am putting her site on my blog roll for future reference. Make sure you scroll down to see how she's made flowers with her Nestabilities! Also, I will be posting a card later--no flowers, sorry!--so keep a lookout! I am doing some baking this afternoon. One of my favorite places to look for recipes is Shak'n & Bak'n. Today I am making Pineapple Banana Bread. It is one of my husband's favorites! 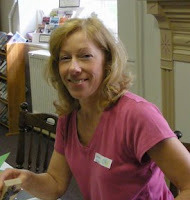 Check out Shelly's blog and see what you think! 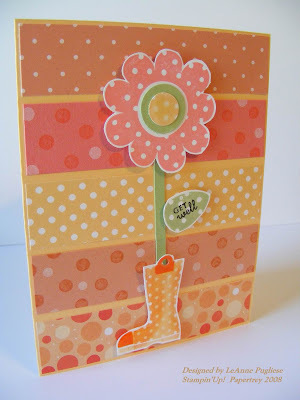 One of my favorite stampers, Silke, aka Sparklegirl, is the Featured Stamper today at SCS! 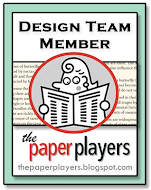 Her designs and layouts are clean, crisp & beautiful! I chose this one to copy because my image from 100 Proof Press is so large. This is the first time I've used this stamp, so I am still "trying it out"! 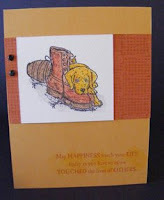 The actual image is stamped in Close to Cocoa, then overstamped lightly in So Saffron with the Linen stamp. I changed a few other elements around, I hope you like it! Click on the photo for a closer look. Be sure to check out her gallery and get a few ideas for yourself! In the process, however, I lost all my links and sidebars, so please have patience with me as I recreate it! Thanks so much! Well, I guess I am on a beach kick! Of all the stamps I have in my stash, I just keep going for beach-themed images! 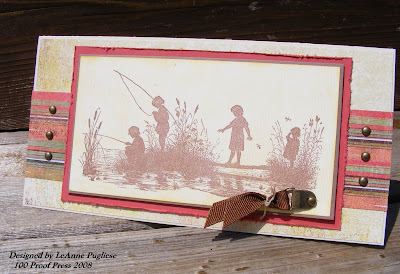 Today's card is for Beate's Weekend Sketch Challenge. I used four patterns of DP from Basic Grey's Two Scoops--two patterned, two plain. 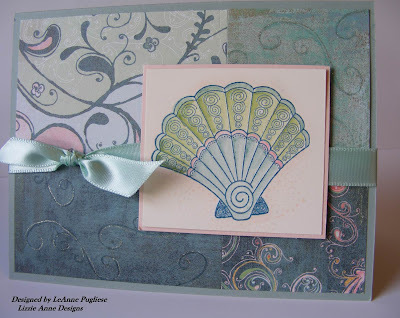 I then stamped the little swirl from Sweet Shapes on the plain in Soft Sky and Blue Bayou, then added some Jelly Roll pen to make it a little shimmery. The image is from Lizzie Anne's Shore Thoughts. 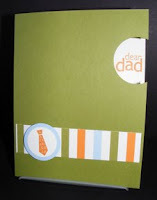 It is stamped in Not Quite Navy craft ink on Very Vanilla and embossed with clear EP. I then used my aquapainters, ink and alcohol to color in the image. I also outlined the image very lightly with Blush Blossom, and if you click on the photo, you can see where I stamped the little dot pattern at the base of the shell also. It is mounted on a piece of Blush Blossom and I tied the whole thing together with Papertrey's beautiful Aqua Mist satin ribbon. 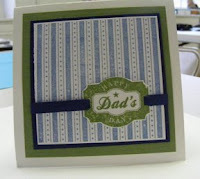 Since the DP is rather busy & swirly, I left the rest of the card plain. The whole shebang is mounted on a card of Sage Shadow. This is a quick post today as it has been a busy day and I still have more to do! 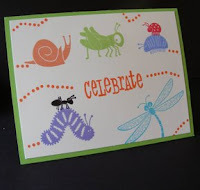 Might not even get to stamp today at all :( I made this card last night before I went to bed! TFL! Well, it is hot & sunny here in PA today, and I am thinking about the beach!! 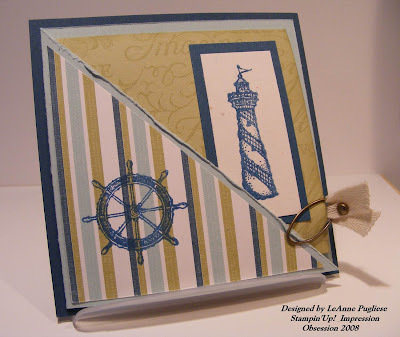 I just got a new stamp set called Nautical from Impression Obsession, and I The challenge today at SCS was to do a long skinny card, so I happened to have a piece of textured Sage Shadow that fit the bill, so this is what I came up with. It is actually about 3"x8", so it will fit into a business-sized envelope. I like the colors I used EXCEPT for the long skinny seaweedy thing in Barely Banana. Yuk. But I didn't feel like starting over, so it's in there! I love the sentiment and thanks to Carrie, I got reacquainted with my SU distresser!! 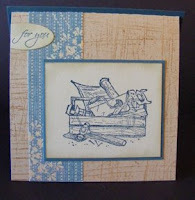 Check out this posting on her blog--which is awesome, by the way---I was amazed at how "distressed" her layers were!! 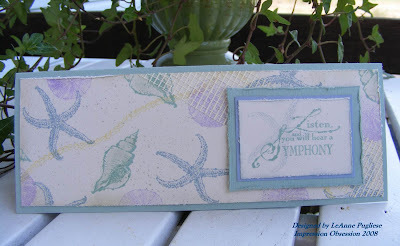 I thought distressing would add to the sea-worn look of this card, so away I went. (Mine still aren't as good as hers!) I also added some retired linen Magic Mesh (I hope you can see it) to sort of look like fishnet. I think I could use this card for one of many occasions! TFL! Remember you can click on the photo for a really good look! 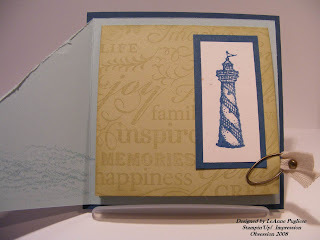 One of my favorite blogs to visit is Sharon Johnson's No Time To Stamp. 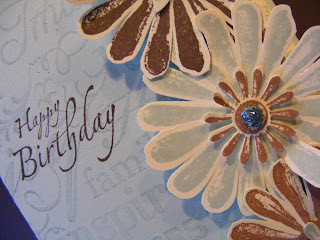 She has clean designs and stresses stamping simply---that is my mantra! 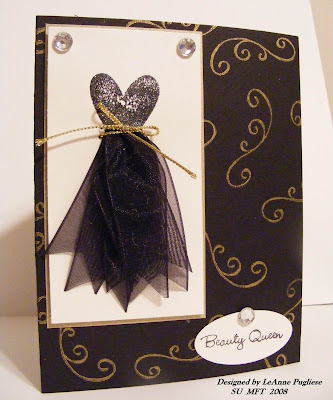 Her challenge this week is to add black to your design. I needed a card for a woman who is going through breast cancer (see her story here) so I thought I would combine the two. It is stamped simply, so there really isn't much to tell--plus I have to put on my accounting hat today and go to work! I did use this layout, though, even though I didn't use any Cornish stamps!! 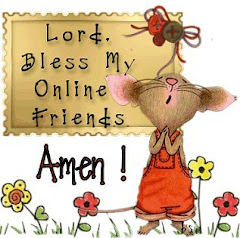 Enjoy this beautiful day the Lord has made!